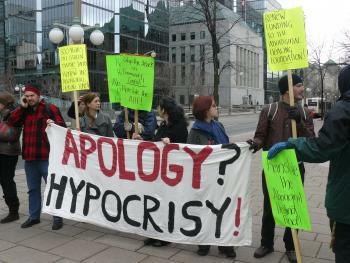 At this present moment it must be recognized that “apology” has been reformulated in Canada’s political discourse as a means to control narrative and protect the interests of the status quo. In this post, I would like to offer a brief critique of what might be called the “deconstructive” or “postmodern” approach to apology, which appears to be in vogue right now. According to Carl D. Schneider, the statements of regret that have the most potential for reconciliation do not attempt to offer a full account of the wrong in question. For him, the proper apology acknowledges its own limitations: “I don’t know what I can say except I’m sorry for what I did. I’m sorry–that’s all I can say” (265). Nicholas Tavuchis makes a similar point in Mea Culpa: “to apologize is to declare voluntarily that one has no excuse, defence, justification, or explanation for an action (or inaction) that has ‘insulted, failed, injured, or wronged another’” (17). Perhaps, if anything, this is what makes a truly sincere apology: the recognition of its impossibility. The notion of an impossible apology resonates with a Derridean approach to the discourse of reconciliation, which is sceptical of the idea that apology or forgiveness can ever be rendered into a political program. For Jacques Derrida, apology and reconciliation depend upon a sovereign to organize them; they require “the power necessary to organize a trial, an applicable judgement or, eventually, acquittal, amnesty, or forgiveness” (Cosmopolitanism 59). Derrida longs for a forgiveness that does not require a sovereign power, but he also wonders how possible this is. Apology theorists working out of the Derridean paradigm solve the problem of sovereignty by usurping the government with the “figure” of the aporia. In this configuration a “healthier” apology is one that recognizes its own “impossibility” rather than pretending to offer a full and complete account for a historical injustice or demanding acceptance. To argue this differently, a Derridean apology “is” only insofar as it deconstructs its own meaning in its utterance. Speer’s statement of regret deserves its own kind of definition. It cannot rightly be entitled an “apology” per se, at least in the sense outlined above, because it explicitly acknowledges the impossibility of that term. On the one hand, if an apology is something that can heal or make up for the past, Speer admits that his words are incapable of the task. On the other hand, to assert that Speer’s statement here is not an apology at all, and therefore is not fraught with the same difficulties I have thus far been unpacking, is also to miss the point. Paradoxically, although he says he cannot apologize, it is in the very act of “not apologizing” that Speer makes his apology viable. To make this point clearer, one need only think of Speer actually saying nothing (as many perpetrators did). If “no apologies are possible,” then nothing can be said, but by saying that he can’t apologize, Speer in fact offers a more possible apology simply because he attempts the unattainable, therefore allowing his audience to suspend their disbelief and trust in his sincerity. 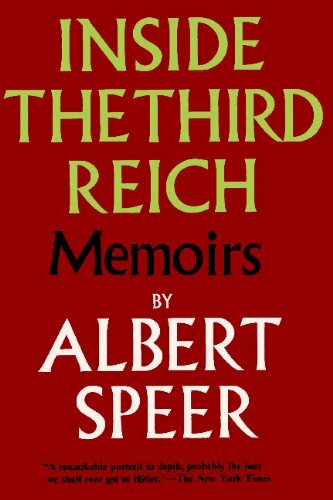 Indeed, “most critics praised his [Speer’s] candour in writing about the responsibility he bore for Nazi excess” (Tavuchis 21). As such, Speer is a primary example of what can only be properly called the (non)apology–which must be differentiated from the disingenuous apology and the non-existent apology–a statement of regret that can be read as acknowledging its own impossibility and in doing so actually allowing it to be possible for its audience. There is an obvious theoretical advantage to sanctioning this type of statement. In making explicit its limitations, the (non)apology engages with J.L. Austin’s logic of the speech act, allowing for radical changes in beliefs and attitudes towards the perpetrator, while still allowing for a healthy measure of uncertainty and scepticism from the recipient. However, while Speer’s “apology” offers a more robust theoretical approach to apology, one should still be wary of how this “deconstructive” approach might function in the world of politics. If one is willing to admit that apologies can be read deconstructively, and thus represent a more politically viable and compassionate way to express regret, one must also be willing to admit that apologists can engage with deconstruction, in order to perform a “sincere” apology as part of a political strategy. Indeed, by privileging the deconstructive element of Speer’s “apology,” Tavuchis overlooks one of the most problematic elements of the officer’s remarks, namely that “how much or how little [he] knew, is totally unimportant” (ibid). In focusing on the “impossibility” of the apology, Tavuchis simultaneously allows Speer to distance himself from the realities of Nazi persecution. His knowledge of the events, and thus ethical responsibility for them, is maintained as secondary to his “sincere” statement of regret. Art Miki shakes hands with Brian Mulroney after the signing of the 1988 Redress Agreement. Despite my wariness of this type of analysis, I don’t want to suggest that deconstruction is entirely unproductive in apology analytics. Rather, I argue that we must remain as vigilant as possible when employing it. Indeed, the (non)apology, in the terms laid out by Schneider and Tavuchis, has its own roots in Canadian history, namely in response to Japanese Canadian internment and the official statements of regret that were offered to this community by the government. In his 1988 apology to Japanese Canadians, then Prime Minister Brian Mulroney appealed to the impotence of his words as a means to convey his sincere regret to that community: “We have all learned from personal experience that as inadequate as apologies are they are the only way we can cleanse the past so that we may, as best we can, in good conscience face the future” (qtd. in Marrus 40). The use of “cleanse” here should rightly cause us to pause, and by no means should Mulroney be held up as the example par excellence of Canadian apology, but there is still a lesson to be taken from this statement. 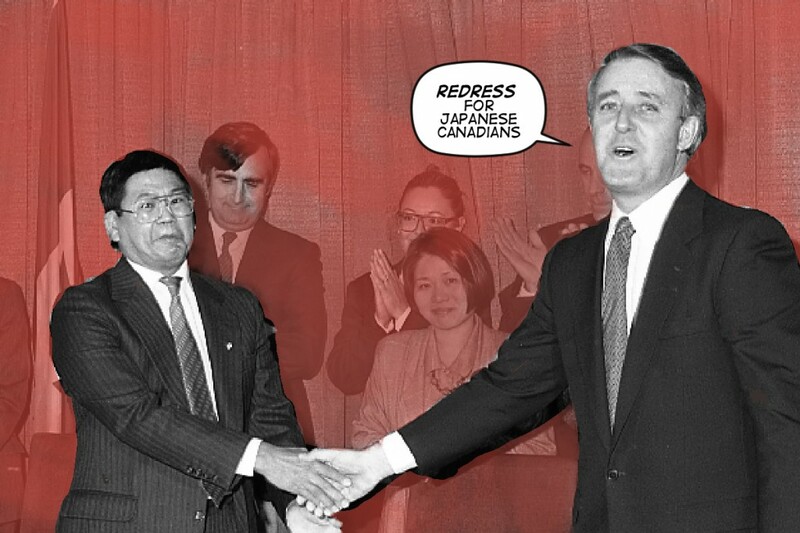 I will take up the issue of Japanese Canadian redress in a later post. Rather than suggesting that an apology can be “full” or complete, as Stephen Harper would later do, Mulroney leaves a small space open for unrest, discontent and the reality of the presence of the past. Aside from his reference to the inadequacy of apology, this all-important gap is also illustrated in the sentence’s only dependent clause, “as best we can,” which interrupts the smooth flow of the “cleansing” narrative. In this interruption, Mulroney affirms the potential of apology while recognizing that the pain and the trauma of internment can never entirely heal. The shift in discourse from Mulroney to Stewart and finally to Harper, which has taken place over thirty years, illustrates how this gap has been closed in official apologies. Statements of regret are now labelled as “full,” complete circles of discourse that annex the past and strive to revise history through acceptance, while simultaneously maintaining colonial ideologies and an unequal distribution of resources. If Canada is to achieve reconciliation out of apology, and thus bring two narratives (Indigenous and settler) together without one colonizing or absorbing the other, researchers and activists need to continue to search for these gaps, and this will require space and time that exceeds a five- (or even six-) year mandate. Without proper consideration, apology can be tactically deployed to serve state interests. Staving off acceptance for acknowledgement can help to open up this space and provide for more critical and compassionate insight on state apologies. In a following post I will be looking at the ways in which redress puts further pressure on victims to accept apologies and further develop an analysis of state-interested reconciliation.